Tua Tagovailoa, Dwayne Haskins and Kyler Murray put up big numbers a season domianted by quarterbacks. NEW YORK — Tua Tagovailoa rolled across the floor of the New York Stock Exchange on a black scooter with a little Alabama sticker on the front, his sprained left ankle in a gray plastic boot, safely propped up as he pushed off with his right foot. 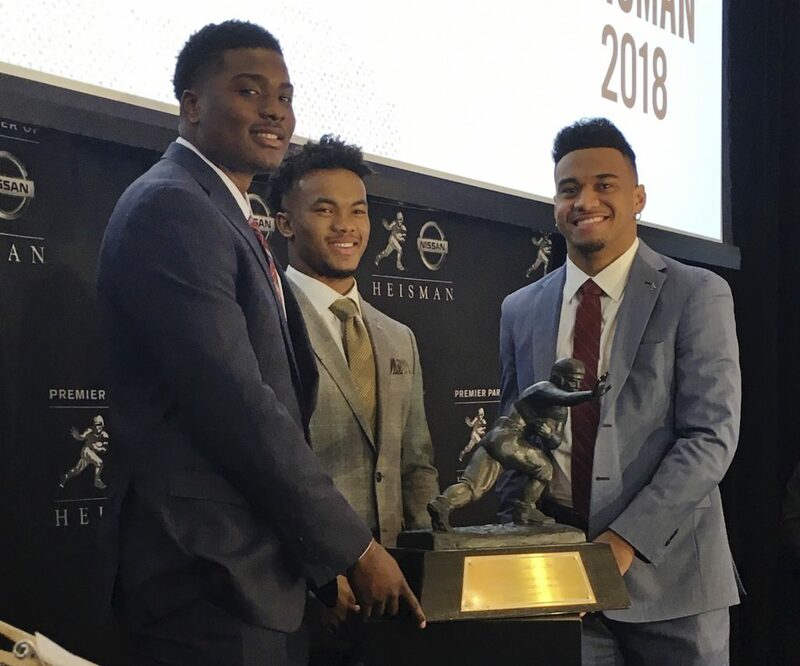 The Crimson Tide quarterback and fellow Heisman Trophy finalists Kyler Murray of Oklahoma and Dwayne Haskins of Ohio State were on Wall Street on Friday to ring the closing bell on a day the Dow Jones Industrial Average closed down 558 points. But stock for the three first-year starters has been soaring this season. A year ago they were second on their team’s depth chart. On Saturday, one of them will win the Heisman Trophy.